Jami-Lee Ross beside Minister Dr David Clark’s Press Secretary, Adam Bennett and Simeon Brown at the blessing ceremony of Tiaho Mai. ‘Courageous and symbolic’ is how Minister of Health Dr David Clark acknowledged MP Jami-Lee Ross’ presence at new mental health unit. 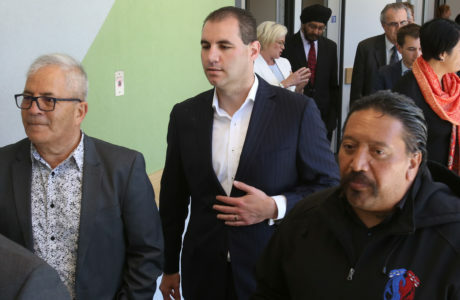 They were at the stage one, ceremonial opening of Counties Manukau Health’s new $57 million Tiaho Mai Mental Health Unit at the grounds of Middlemore Hospital on Thursday. It was Ross’s first public appearance since the political upheaval which sent tremors right through the National Party. He was also admitted to the unit at the height of a national scandal which saw him expelled from the National Party after a report deemed it likely he was responsible for a media leak. He denies it. Ross also accused National leader Simon Bridges of electoral law impropriety, released bugged conversations to media and admitted infidelity before being admitted to Tiaho Mai. The Botany MP said he was at the facility opening simply to acknowledge “all the care and support he received from the staff at the mental health care unit” when he was going through the roughest phase of his life. “I’m not here to talk politics,” a rather subdued Ross told the Times, even as he evoked a lot of media interest with television cameras being focussed on him. While Ross was apprehensive how his presence at a public event would be perceived, it seemed like he was in safe territory as the Labour Party Minister made it a point to personally greet Ross “and respectfully welcome” him. 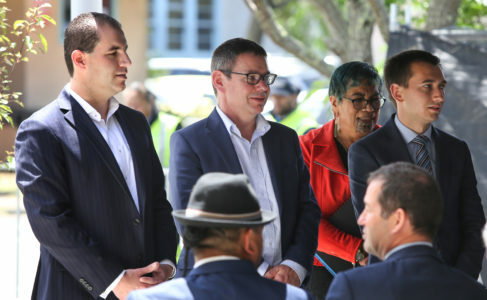 “I am delighted that Jami-Lee on his part thought it is appropriate to be here,” he said later, as television crews questioned the minister about Ross’s attendance at the opening of Tiaho Mai (which in Te Reo Maori means, `the light that comes from the moon and the stars shine here’). While Pakuranga MP Simeon Brown and National Party List member, Kanwaljit Singh Bakshi kept a safe distance from Ross that afternoon, they did eventually say hello to their former colleague and asked how he was doing. Clark said that the bright, state-of-the-art, patient-centred 38-bed adult mental health inpatient facility, which is unlike a prison with barred windows and a high fence, has an open courtyard that helps improve safety and visibility within the unit. “The government has prioritised mental health, with the number of people assessing mental health having gone up to 70 per cent in New Zealand,” he said. Large rooms and corridors with a specially-designed shower facility as well as the light and open spaces in the high dependency unit ensures everyone can access outdoor spaces and fresh air without needing fenced external areas. The long awaited unit was developed using a co-design approach. “Key to the unique new building were the many families, staff and cultural groups consulted throughout the design and build,” said general manager Mental Health at Counties Manukau Health, Tess Ahern. “Safety for both service users and staff is a big focus. Several visits to other inpatient units both in New Zealand and Australia were also organised,” she said. With 55 per cent of Tiaho Mai service users being identified as Maori, the facility contains a modern whare (carved meeting house) and wharekai (dining room) to promote Maori mental health. “What we have achieved is a facility so advanced from the mental health wards of years gone by. We believe that the building is future proofed to promote mental health wellness and recovery,” she said. Stage two of the project will begin in early 2019, and, when complete, will accommodate 76 patients.